Kathryn from Tikiboo Kids was the winner of the MyMonkeymoo giveaway and I have long loved her beautiful kids fashion clothing range. Brisbane-based Kathryn and her Mum Christine design high quality clothes for girls and boys aged 2 to 6+ years. You'll find lots of pretty designs with sweet embellishments in fun and hard-wearing designer fabrics. I'm a sucker for the damask skirt and rosette duo (top image) as well as the too-adorable Olivia The Pig ruffled pants (bottom image). You can find Tikiboo Kids in the All You Need online store as well as at stockists including Australian online retailer La Toriana. Find out more about Tikiboo Kids on the blog where you might even win a giveaway. And check out Tikiboo Kids at the upcoming Mathilda's Markets in Brisbane on 19th July, 2009. Kathryn is also the blog author of the great Mama Loves To Shop blog that is worth checking out, as well as co-author of Blog This! - a fun blog meme project with weekly goals (that I have just joined). Thanks so much for sharing all the lovin' goodness from Tikiboo. Always soo sweet. AAAWWWWW How gorgeous are those pants!!!! Hi lovely ladies Kim, Helen and Bec - so glad you like; there's something to be said for good handmade quality clothes. 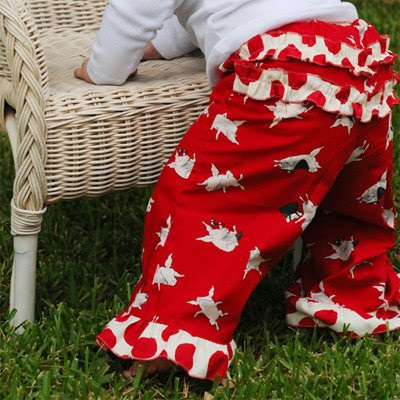 I love the Oliva The Pig ruffled pants! Hi Al Little Bit of Cheek, I could eat those pants! How cute!!! Really adorable. Thanks for the post.